If you are looking for premium glass supply and repair services, you’ve come to the right place. Something broken? We can handle all glass repair. Bring us your broken window panes, picture frames, glass shelves, tabletops, or decorative items and we’ll fix it for you! 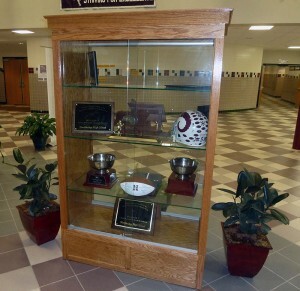 A trophy glass case allows Northbridge High's accomplishments to stand out! Plate glass, also known as flat glass, provides a literal window into your space where you can show off all you have to offer. It is an incredibly flat, distortion-free piece of glass that will make your business stand out from the rest. This product is made through the float glass process, where glass is laid on a bed of molten metal, typically tin. The tin is then slowly cooled until the glass solidifies, providing uniform thickness and that incredibly flat look you're going for. Have a restaurant, café, or other commercial building that you really want to stand out? Talk to our experts about your glass options. We'll craft a custom look using the best glass in the business. Call us today for a no-obligation estimate! Museum glass virtually eliminates reflections and blocks up to 99% of ultraviolet rays which can protect your products for hundreds of years. It also protects and brightens colors. You can use it for framing photos and art to protect it, as well as displaying family heirlooms or personal mementos. For more information, click here. We have specialists dedicated to serving all your glass repair or replacement needs with the best available material and cutting-edge technologies. We deal in all kinds of plain, tempered, toughened and designer glasses. We can also cut custom pieces to replace irreparable items. Picture frames, window frames, glass shelves and other decorative items are made up of fragile glass that can be easily broken and will require glass repair. A simple accident can lead to a big loss. Usually, a little damage can impact the integrity of the entire glass and needs to be fixed immediately by professionals – which we are. If you’re looking for glass to protect your fireplace or stove, please click here. Pioneer Glass offers specialized services for a range of glass repair work: homeowners, residential buildings, commercial buildings and offices. We will work with the needs of customers to create creative designs with superior quality products to solve all glasswork needs of our customers. We always strive for excellence in assisting you for your glass repair needs. Looking for information on window replacement, whether single-pane or double-pane windows, check out more information here. If your window is fogged up, we can help!